Dam Safety Improvements and Reconstruction at Chandler’s Mill PondThe Department of Game and Inland Fisheries has begun dam safety improvements and reconstruction at Chandlers Mill Pond, located in Westmoreland County, near the town of Montross. In 2015 a breach occurred due to "piping" or unseen erosion occurring underneath the spillway. The reconstruction of this facility will bringing the dam into compliance with the current State Dam Safety Act. Construction includes raising the earthen dam height, constructing a new primary spillway structure and fish passage, removal of the existing concrete outlet structure and existing fish passage and rebuilding the dam in this location. Construction is ongoing and planned from mid-October 2018 extending through May 2019. Public access to the dam and drained impoundment area will be prohibited during construction. Following construction, fish populations in Chandler's Mill Pond will be monitored and supplemental stocking considered as necessary to ensure a healthy recreational fishery for Virginia's anglers. Chandler’s Millpond is a picturesque 75-acre impoundment located in Westmoreland County in the northeast of Virginia. The Sturman family originally built it around 1670 on Cat Point Creek. The pond is privately owned by several individuals, but the Department of Game and Inland Fisheries has an agreement with them to allow public fishing. Following a large storm event during which up to 16 inches of rain fell in some parts of the watershed, the dam was breached in September 1993. During the winter of 1994-1995, the dam was rebuilt and a Denil fish ladder was added to accommodate potential spawning runs of river herring that historically ascended the stream. The pond was stocked with bluegill, largemouth bass, redear sunfish and channel catfish and was closed to fishing to allow these fish to establish a self-sustaining population. On July 1, 1998 the pond was re-opened to public fishing. Recent electrofishing surveys revealed an abundance of bluegills, largemouth bass, and redear sunfish. Decent numbers of black crappies were also collected. Species collected in lower abundance were: brown bullhead, channel catfish, flier, chain pickerel, American eel, warmouth, creek chubsucker and gizzard shad. The pond has an average depth of about 6 feet, supports good stands of aquatic vegetation and the shoreline is largely wooded. It has a boat ramp and a courtesy pier. Chandler’s Millpond has good diversity with 9 species collected during the latest electrofishing survey. The majority of the angling opportunities come from the populations of largemouth bass, bluegill, redear sunfish and black crappie. The development of this fishery was hindered by an influx of black crappie and flier from the headwater streams. An overabundance of these species had a negative impact on bass recruitment. To remedy this situation, a catch and release regulation was placed on the largemouth bass fishery. Supplemental stockings of largemouth bass were carried out. Given several years to respond to the catch and release regulation, the bass population was able to achieve a favorable balance. The catch and release regulation on bass has been lifted and a 12-15 inch slot limit has been put in place. The slot limit will allow anglers to harvest bass less than 12 inches or over 15 inches in length. This regulation will hopefully prevent the fishery from becoming crowded with bass in the 9 to11 inch range and allow for good growth rates. Anglers are reminded that the creel limit for bass is 5 per day. The 2008 electrofishing survey collected a total of 102 bass for a catch rate of 102/hr. This catch rate showed an improvement from the 2007 sample (76 bass/hr). The sample revealed a rather balanced bass fishery with numerous year classes presented. Bass ranged in size from 3 to 23 inches in length. The largest bass weighed 6.9 pounds. The survey collected 16 bass that measured 15 inches or greater. Weights of all bass collected showed decent relative weight values that were similar to the values found in 2007. Chandler’s Millpond has a decent number of fallen trees that are attractive to fish as well as fishermen. The bluegill population is primarily based upon fish in the 4 to 6 inch range. The electrofishing survey collected a total of 77 bluegills in 20 minutes of sampling time. The expanded catch rate of 231 bluegills/hr is well below the 2007 catch rate (367.5 bluegills/hr). The bluegill size distribution ranged from 1 to 7 inches. A total of 19 bluegills were greater than 6 inches in length. The presence of gizzard shad within the fishery has most likely resulted in the increased competition for zooplankton and the decreased growth rate of bluegills. Since bluegills were collected during just one of the sample runs, it is likely that the overall catch rate could have climbed higher if the second or third run was a complete community run. The redear sunfish population appears to be in decent shape. A total of 23 redear sunfish were collected during the first sample run (20 minutes of effort). The expanded catch rate of 69 redear sunfish/hr showed a decline from the 2007 survey (112/hr). The redear sunfish ranged in size from 5 to 8 inches. These fish will provide added excitement to anglers that are fishing for bluegills. Additional redear sunfish were seen along the shallows during the second and third sample runs. These fish were in the middle of spawning. No attempts were made to remove these fish from the beds that they were on. Early May is usually the prime time to find a high percentage of the redear sunfish up tight to the bank with spawning on their minds. The black crappie population appears to be in fair to decent shape. The overall abundance might not be that great, but the size structure is favorable. The 2008 electrofishing survey collected 21 black crappies (21 per hr), which was exactly the same total as the 2007 survey. The 2008 distribution ranged from 6 to 12.5 inches in size. The majority of the sample was in the 8 to 10 inch range. Anglers may be able to find small schools of black crappies while searching the pond for other species. 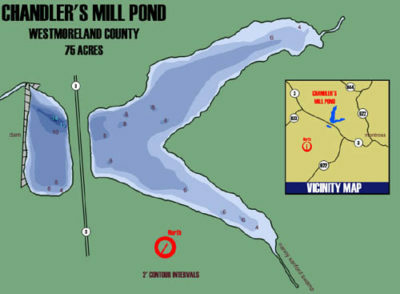 Chandler’s Millpond provides some additional diversity in the form of chain pickerel, American eel, channel catfish, golden shiner and gizzard shad. Each of these species is present in limited abundance and may surprise an angler from time to time. The catch and release regulation on the largemouth bass fishery has been lifted. There is a now a 12-15 inch slot limit in place on the largemouth bass. No bass between 12 and 15 inches can be harvested or possessed. A creel limit of 5 bass per day can be harvested. The pond is open 24 hours per day, 7 days per week. Facilities include a boat ramp and courtesy pier off of Route 3. The parking lot entrance is adjacent to the little league field. Notice (Updated 5/20/15): Due to severe erosion that occurred at the spillway in May 2015, the pool has been lowered to protect the dam from further erosion until repairs can be made. The lake will be closed for public fishing until further notice. During the last fish population survey on May 6, 2008, fallen trees were once again found to be particularly good hot spots. A high number of bass were holding along these trees. Lily pads in the upper ends of the two branches of the pond also offered good habitat for bass. The 2008 survey collected a total of 102 largemouth bass in one hour of sampling effort. This catch rate showed a favorable improvement from the 2007 survey which only yielded 76 bass/hr. The bluegill catch rate of 231/hr showed a decrease from the 2007 survey (367/hr). A high proportion of the bluegills were in the 4 to 6 inch range. The redear sunfish catch rate of 69/hr showed a decrease from the 2007 survey (112/hr). The decrease in catch rates for both bluegills and redear sunfish may be the result of increased angler harvest that has been occurring over the last year or from the increase foraging of bass in the 10 to 15 inch range. The survey only collected a couple channel catfish, but anglers that fish Chandler’s on a consistent basis have been able to catch some decent numbers of channel catfish. Fishing this pond should be a nice alternative to fishing some of the bigger waters. The 2008 fishing season as of the end of July has produced 3 citation largemouth bass. Trophy fish awards revealed that anglers reported 5 citations during 2007. Those citations were 4 largemouth bass and 1 chain pickerel. The 2006 fishing season produced a total of 12 citations with 6 largemouth bass, 5 chain pickerel and 1 carp. The 2005 season revealed one of the best years with 14 citation largemouth bass and 2 chain pickerel reported.